Abstract : Many light transport related techniques require an analysis of the blur width of light scattering at a path vertex, for instance a Beck-mann roughness. Such use cases are for instance analysis of expected variance (and potential biased countermeasures in production rendering), radiance caching or directionally dependent virtual point light sources, or determination of step sizes in the path space Metropolis light transport framework: recent advanced mutation strategies for Metropolis Light Transport [Veach 1997], such as Manifold Exploration [Jakob 2013] and Half Vector Space Light Transport [Kaplanyan et al. 2014] employ local curvature of the BSDFs (such as an average Beckmann roughness) at all interactions along the path in order to determine an optimal mutation step size. 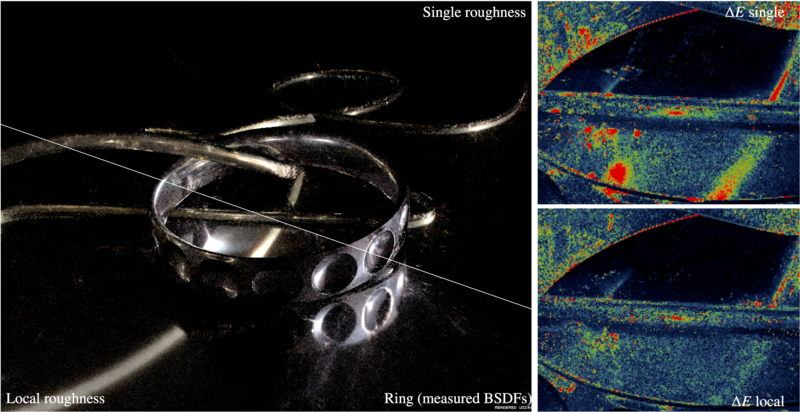 A single average Beckmann roughness, however, can be a bad fit for complex measured materials (such as [Matusik et al. 2003]) and, moreover, such curvature is completely undefined for layered materials as it depends on the active scattering layer. We propose a robust estimation of local curvature for BSDFs of any complexity by using local Beckmann approximations, taking into account additional factors such as both incident and outgoing direction.